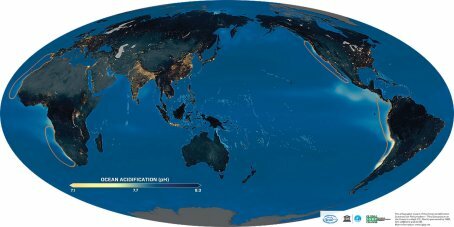 This map shows aragonite saturation as projected in 2100. Regions in blue are values where corals and carbonate-shelled creatures can continue to grow. Regions in red are where the saturation levels are too low, and corals and shelled creatures will have a hard time building up their carbonate skeletons and shells. At these levels, corals might even start to erode away. Click the image to download a high-resolution jpeg file. Human emissions of carbon dioxide to the atmosphere have impacts on Earth’s ocean waters, in a variety of ways. 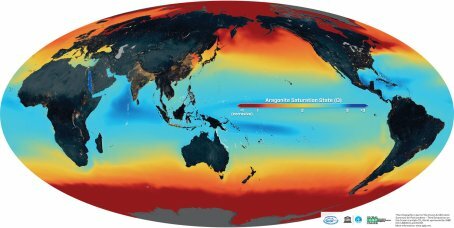 The biggest global impact will be ocean acidification, projected to increase by 170% this century. As pH shifts in ocean waters and the carbon balance changes, substantial costs are expected from ocean acidification — including coral reef loss and declines in shellfisheries. Cold water corals are also at risk. The average pH of ocean surface waters has fallen by about 0.1 units, from 8.2 to 8.1, since the beginning of the industrial revolution. This corresponds to a 26% increase in acidity. Please see original infographic for sources and further information. Compared with preindustrial levels shown here, the projected increase in ocean acidity is about 170% by 2100 if high CO2 emissions continue (RCP* 8.5). Observations of CO2 (parts per million) in the atmosphere and pH of surface seawater from Mauna Loa and Hawaii Ocean Time-series (HOT) Station Aloha, Hawaii, North Pacific. Global CO2 emissions (white dots, uncertainty in grey) from fossil fuel use is following the high emissions trajectory (red line, RCP* 8.5) predicted to lead to a significantly warmer world. Large and sustained emissions reductions (blue line, RCP* 2.6) are required to increase the likelihood of remaining within the internationally agreed policy target of 2°C. 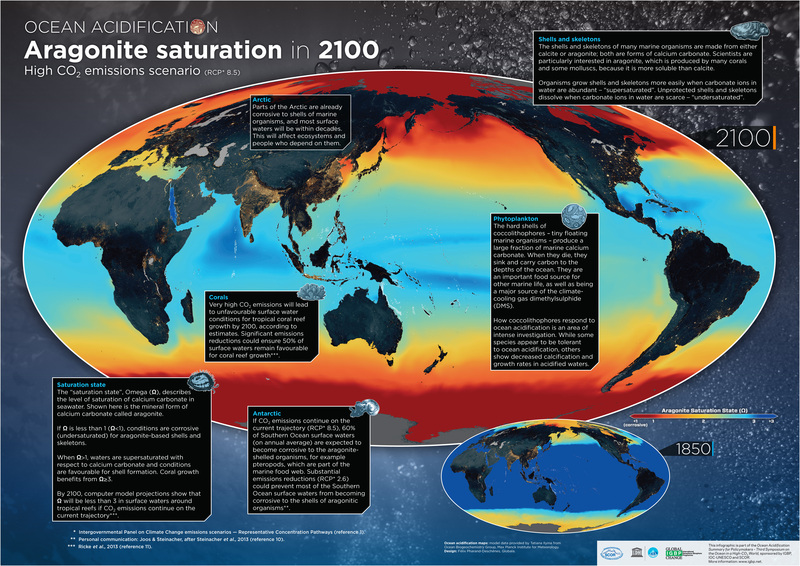 Credit: Glen Peters and Robbie Andrew (CICERO) and the Global Carbon Project, adapted from Peters et al., 2013 (reference 8). Historic data from Carbon Dioxide Information Analysis Center. 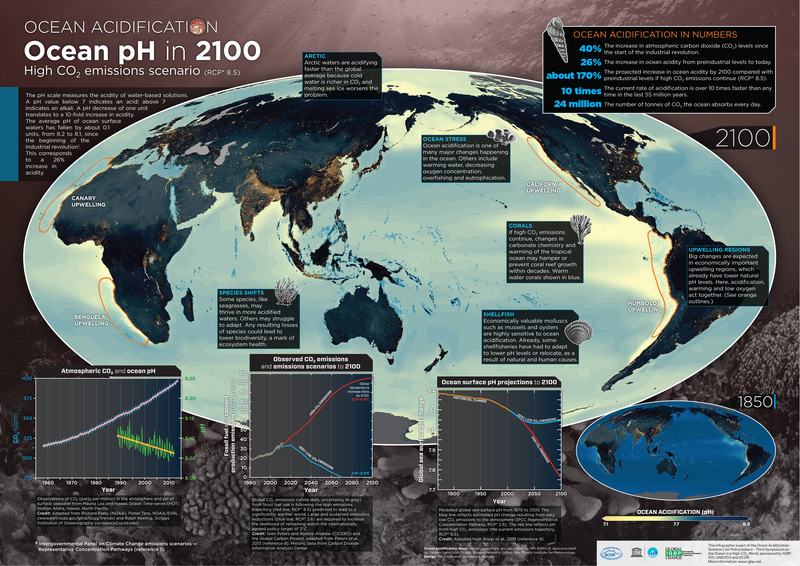 Modelled global sea-surface pH from 1870 to 2100. The blue line reflects estimated pH change resulting from very low CO2 emissions to the atmosphere (IPCC Representative Concentration Pathway, RCP* 2.6). The red line reflects pH from high CO2 emissions (the current emissions trajectory, RCP* 8.5). Credit: Adapted from Bopp et al., 2013 (reference 9). 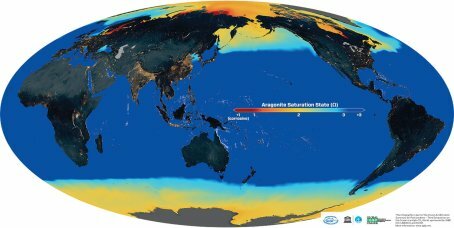 This map shows the “saturation state” for the mineral form of calcium carbonate called aragonite. If Ω is less than 1 (Ω<1), conditions are corrosive (undersaturated) for aragonite-based shells and skeletons. Coral growth benefits from Ω≥3. By 2100, computer model projections show that Ω will be less than 3 in surface waters around tropical reefs if CO2 emissions continue on the current trajectory. Aragonite saturation for surface ocean waters, at the beginning of the industrial revolution. This entry was posted in For the Public. Bookmark the permalink.